Obama presented his first budget on May 11, 2009, a month and two days longer than President George W. Bush’s budget was released during his first year in office. However, every year after that his budget was delivered in February, just like George W. Bush and President Bill Clinton. This year, on the other hand, Obama was two months late. Not the end of the world but this was the latest submission by an incumbent president as far as I could go back, 1923. Why the budget was late is really a non-issue. Each party will blame the other or the circumstances of the economy for tardiness. What matters now is how we use this information to understand the priorities of our government; see National Security budgets (of which these are several) vs Medicaid or Science, NASA or even Veterans Affairs. 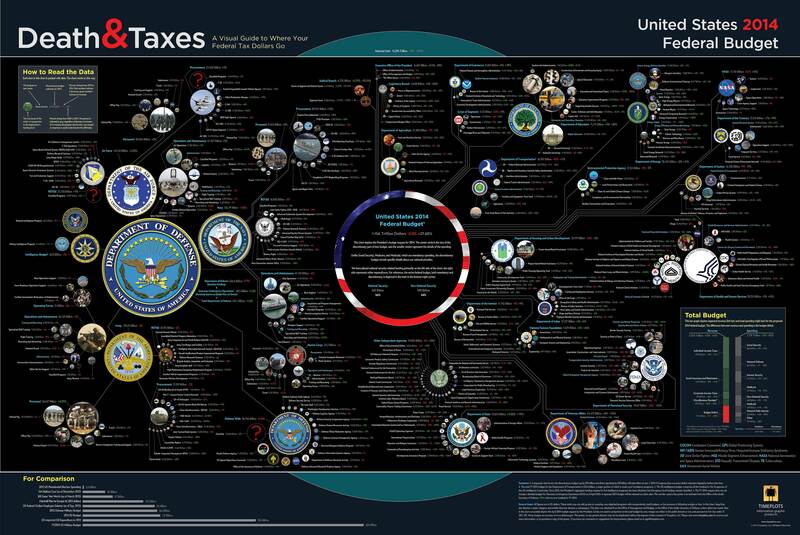 The next most interesting feature of the info graphic is the “Total Budget,” as seen above. This tracks the incoming and outgoing dollars. 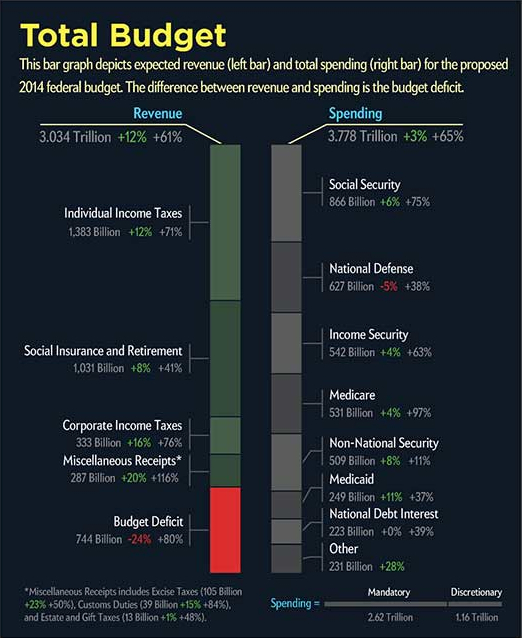 What sticks out to a lot of people is probably the red Budget Deficit at the bottom of the chart. Lines up beautifully with the Medicaid, National Debt Interest and “Other” revenue negative items on the right huh? I’m going to ask you to think about this differently. Instead scroll up on the biggest money maker, National Income Tax, $1.383 trillion in revenue. That’s massive. Now skip down to Corporate Income Taxes, $3.33 billion. Wait what? 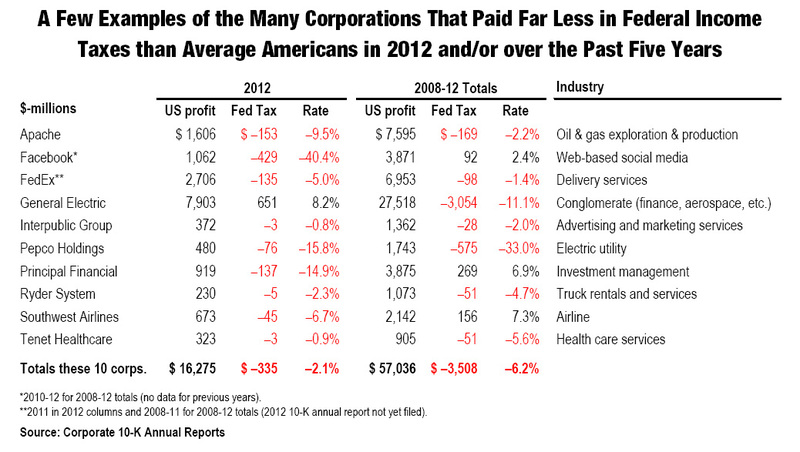 Corporations pay 75.92% less in taxes? I’m going to do some rough back of the envelope math that will probably end up being horribly embarrassing but hear me out (and leave a friendly comment with corrections?). There are around 150,000,000 people living in America that are gainfully employed according to the Bureau of Labor Statistics. The average household income in America is $50,100 across 115,000,000 households. Let’s multiply those two numbers. Americans made $5,761 trillion in 2012. So it’s a 5.7 to 1.2 ratio, citizens vs corporations in revenue. But how can that be? Many, perhaps most, of these companies didn’t pay even close to the amount of taxes there were supposed to pay. Dutch Sandwiches and Double Irish schemes are just two of many methods corporations use to get away with paying zero in taxes. Some companies even get money back! It’s America’s small businesses that cover the rest of these taxes. Businesses like mine and the ones I work for. They can’t afford to open “branches” in Ireland or hire accounting firms willing to manage the risk and complexity of avoiding paying corporate taxes. The effective corporate tax rate in America is 12.1%, the lowest since World War II (pay wall) instead of the 35% the government has set for them. And in the end we all, as Americans, are paying for these loopholes. Even Tim Cook from Apple, one of the World’s most profitable companies agrees that tax reform needs to happen. Did I mention Apple pays either 8.2% taxes, 9.8% in taxes or 14% in taxes? Still less than half at best. This CTJ report illustrates how profitable Fortune 500 companies in a range of sectors of the U.S. economy have been remarkably successful in manipulating the tax system to avoid paying even a dime of tax on billions of dollars in profits. These ten corporations’ tax situations shed light on the widespread nature of corporate tax avoidance. I highly recommend you read the full report from Citizens for Tax Justice. Did I mention that American corporations have around $2,000,000,000,000 cash on hand? No money to hire people or invest in researching new technologies (I’m looking at you Energy Industry)? The budget is interesting for all of the reasons illustrated by the fantastic infographic but for me the revenue vs expenditure chart equal attention, even fi it is just one small corner of the image. This entry was posted in Life, Politics, Tumblog and tagged Barack Obama, Bill Clinton, congress, Economic, federal budget, George H. W. Bush, George W. Bush, GOP, Government, Income tax, Obama, President of the United States, United States, United States Congress, United States federal budget, United States Federal Government by Justin Scott. Bookmark the permalink.